I imagine everybody thinks about taking a break from their jobs and just traveling around for a while. Seems so perfect at first, but too quickly the needle of logic pops our fantasy bubble. What about my job? What to do with the house? Who's going to water the lawn and flowers? Will my car even make it that far and besides, where will we sleep, eat, shower, etc. etc. etc. That's how we use perfectly sound logic to shackle ourselves down. After a particularly rough day at work, Jill was the one who first voiced out loud the thought of just taking a leave of absence from her job. I only had to say "OK", and from that point on neither of us called the bluff. We just marched forward, taking each step one at a time. Easy. Maybe a little frightening at first, but certainly easy. After we decided to really travel for a year, it became clear that it would be a far more pleasant experience with a more accommodating vehicle than our Asto Van. The van has been perfect for us on 2-3 week trips, and, with tented windows and an unassuming forest green color, it's unsurpassed for "stealth camping". We can easily "disappear" onto a quiet side street at night to sleep undisturbed and get a fresh start in the morning. We have also visited some of the most beautiful and popular places, enjoyed 5-star hotel amenities, and then comfortably retired to our van in the parking lot. But the thought of spending extended rainy stretches in a van AND remaining best friends seemed..., well, ...why push a good idea to ruin? 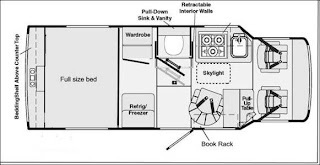 We wanted the advantages of our small vehicle with the amenities and roominess of a larger RV. Except we don't like large RVs. So after a thorough search of vehicle options we discovered that a Rialta might suit us perfectly. 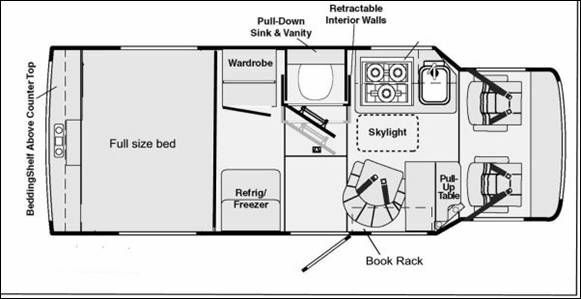 With a VW Eurovan cab/chassis and a camper shell installed by Winnibago, it gets great milage (18-22 mpg), is less than 22' long and yet has the comforts of a bed, table, toilet, shower, stove, AC, hot & cold running water and more. As soon as we saw one we knew this was for us! Manufactured for a decade beginning in 1995, there are several model interiors for the Rialta and we chose a 2003 or later "HD" version as best suited for a traveling couple – although since owning our Rialta we've also comfortably done shorter trips with our 4-year old grandson and our Golden retriever. As we had started shopping around, we discovered resale values run typically much higher than Blue Book and more than we were comfortably expecting to spend. But in early December, after only two weeks of serious looking, we found one in great shape selling in Florida for a great price. Sounds great, eh? And here's where the life-changing, cut the shackles, commitment part happened: After some back-and-forth with the seller, I flew down to inspect it, bought it and then started the drive back to the Pacific NW. Along the way, I purchased a tiny little "Christmas tree" looking potted plant and installed a string of white Christmas lights in the new rig. When Jill joined me in Texas over her holiday break, we continued our drive home, spending Christmas together somewhere on the road. Our new rig was the perfect gift to each other because it was also the key for even more fun and adventure to come. From that point on, we were on our way!